Doris A. Van Hoogen, 76, formerly of Ellen’s Home in Port Washington died Thursday, May 1, 2008 at Heritage Nursing and Rehabilitation Center in Port Washington where she had resided for the past month. 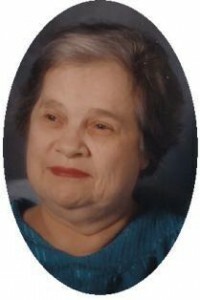 She was born in Milwaukee to James and Irene Kaye Wicker on September 26, 1931. The family moved to Green Bay, Wisconsin and she graduated from Green Bay East High School. She married Harold G. Van Hoogen of DePere, Wisconsin on September 10, 1955 in Green Bay. He Preceded her in death July 30, 1988. Doris came to Port Washington in 1964 and lived on E Jackson Street and W Grand Avenue. She was a homemaker and raised her family. For many years she dealt with health issues and moved into Ellen’s Home a few years ago. She enjoyed knitting, the Green Bay Packers and attending St. John’s Adult Care in Lakeview over the years. She is survived by her sons Jim and Tim Van Hoogen of Port Washington and her brother James (Barbara) Wicker, Jr. of Pound, Wisconsin, nieces, nephews, other relatives and friends. Reverend James Ernster will officiate funeral services 4 pm Sunday, May 4, 2008 at the funeral home. Interment Fort Howard Memorial Park. Visitation 2 – 4 pm Sunday at the funeral home. Memorials appreciated.